Kaya Press editors and authors in their booth at AWP. Editors find themselves in a unique position of power. They function as gatekeepers who determine what voices are heard and who gets to tell their stories on the page (or online). 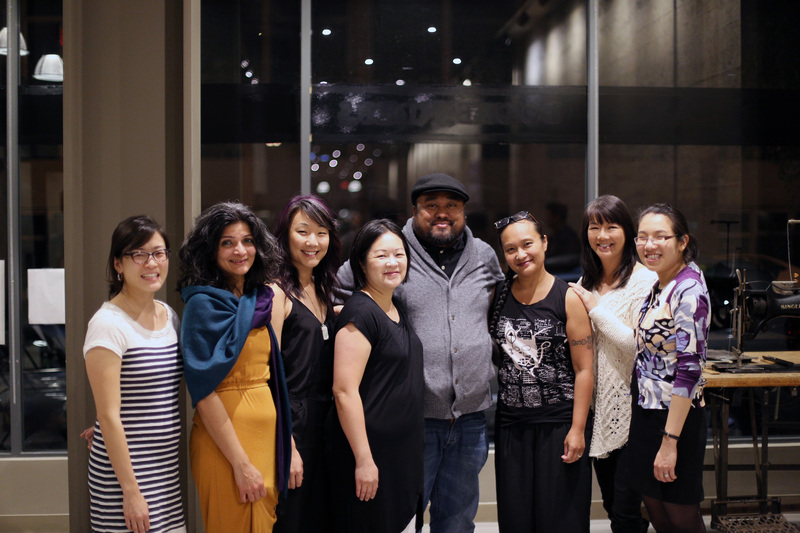 At Lantern Review, we are keenly aware of the need for publishing spaces that highlight writers of color (and in particular, Asian American voices), and we strongly desire to not only do so with our own editorial work, but to empower more APIA writers to edit and curate such spaces themselves. 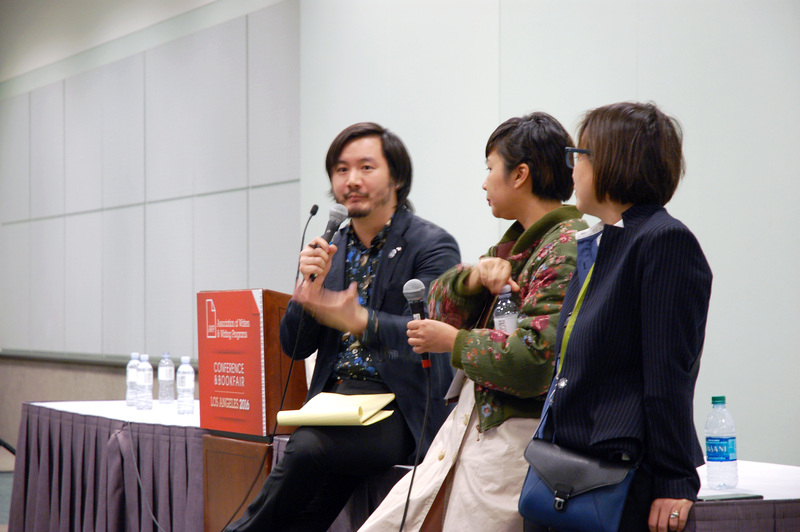 As Boxcar Review editor Neil Aitken and Kaya Press editor Sunyoung Lee shared at the AWP Asian American caucus, if there are no preexisting spaces for publication that let us tell our own stories on our own terms, then we need to be strategic about building our own spaces where we can do just that. Accordingly, one of LR’s hopes for the current iteration of our magazine and blog is that we’ll eventually be able to provide useful resources for APIA writers who are interested in taking up editorial work or in going into publishing themselves. We need more individuals from our community who are invested in pursuing careers in publishing, so as to influence industry-wide change from the inside out. 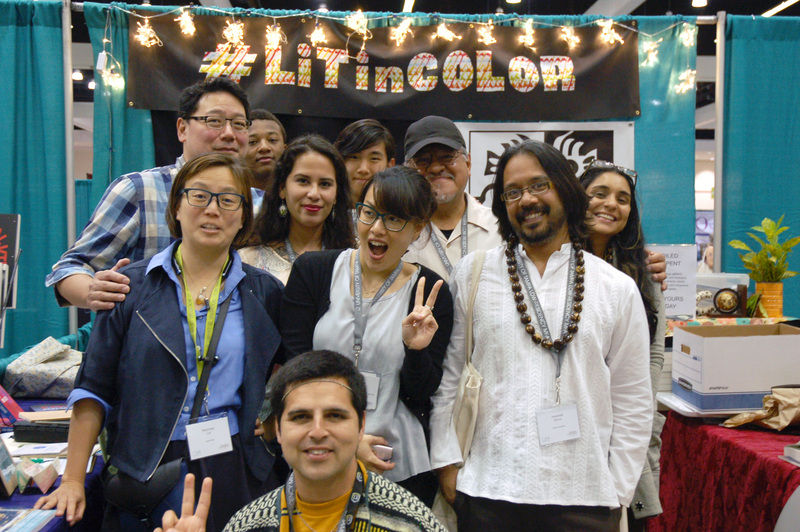 Friends from Kundiman at AWP. But non-editor individuals in our community can do gatekeeping work, too. We have been inspired by so many teachers, poets, and advocates who have given generously of their time and have used their influence to support the voices that we have published over the years. And in the wake of this spring’s incidents—and before that, last fall’s Best American Poetry controversy—we were further encouraged by those individuals who turned the conversation toward celebrating and promoting the work of real-life Asian American literary voices by using the #actualasianpoets hashtag and by writing roundups and lists that made their way around the net. From consciously supporting the work of organizations like Kaya Press, UCLA’s AALC press, and the Asian American Literary Review, whose missions are devoted to publishing Asian American literature and critical texts in the field of Asian American studies; to buying physical copies of books by APIA writers; to writing reviews of APIA writers’ work; to requesting that our libraries and local bookstores stock books by APIA writers; to teaching APIA writers’ work in our classrooms and inviting the authors of these books to speak locally—these are all things that we can do to “vote with our dollars,” in order to support the existing published work of community members and to let publishers and readers know that not only there is a market hungry for more books by APIA authors, but that the work that is currently being produced by the APIA community is eminently worth reading. Grace under fire. Brynn Saito reads at the American Bookbinders Museum despite a recently injured hip. It’s so easy to become burned out when the weight of responsibility for educating others falls heavily on our own shoulders. Speaking up, making ourselves heard, advocating for one another—this is all emotional labor, and it is difficult. So how do we resist allowing ourselves to be broken by the enormity of this work? Practicing making space in our community to listen patiently to one another, to encourage each other, to acknowledge each other’s differing styles of processing pain and frustration, and to have grace with one another when we need to step back from the front lines to simply tend to ourselves and to heal, is as important as the need to speak up and to keep critical vigil. We need to protect and lift one another up, to make room for the diversity of experiences within our community, to encourage self-care, and to resist the temptation to take advantage or to push one another into places that are unsafe or unhealthy. 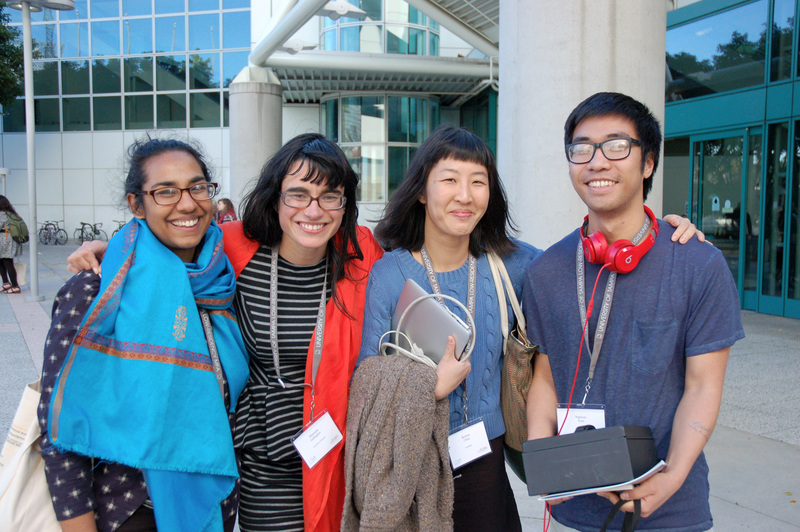 Hardworking organizations like Kundiman, the AAWW, Kearny Street Workshop, and VONA do so much to create safe community spaces through retreats, professional guidance, support networks, and discussion forums, but their work demands the commitment of individuals to cultivate an intracommunity culture of inclusivity, support, and grace. 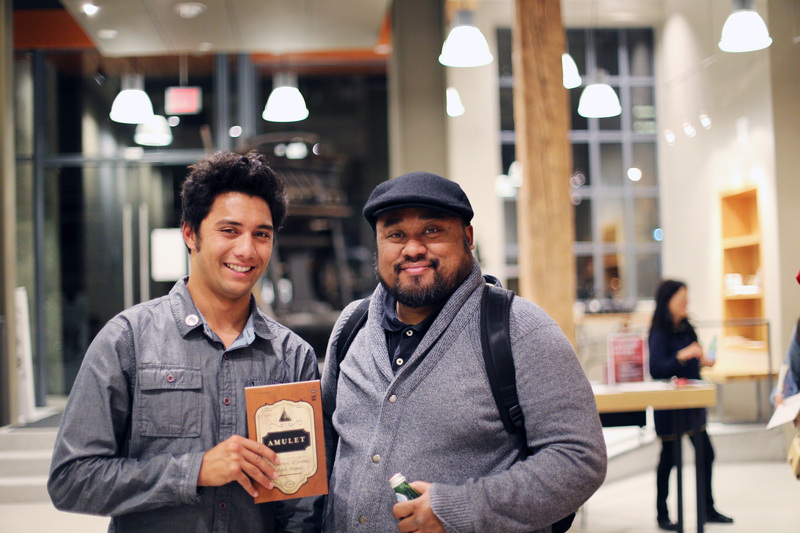 Jason Bayani (R) with museum staff after the former read as part of LR’s event series at the American Bookbinders Museum. We can’t do this alone. We need allies who are willing to truly listen to and validate our concerns (rather than attempting to speak for us), to acknowledge ways in which we have been silenced, and who are ready to take risks and to use their platforms, whatever they may be, to strategically counter past erasures by making sure that Asian American (and other PoC) literary voices are heard and that their worth is recognized by readers. We respect the work of the many publishers (especially small independent and university presses) who are already making a concerted effort to push for and solicit more voices of color to appear in their frontlists. 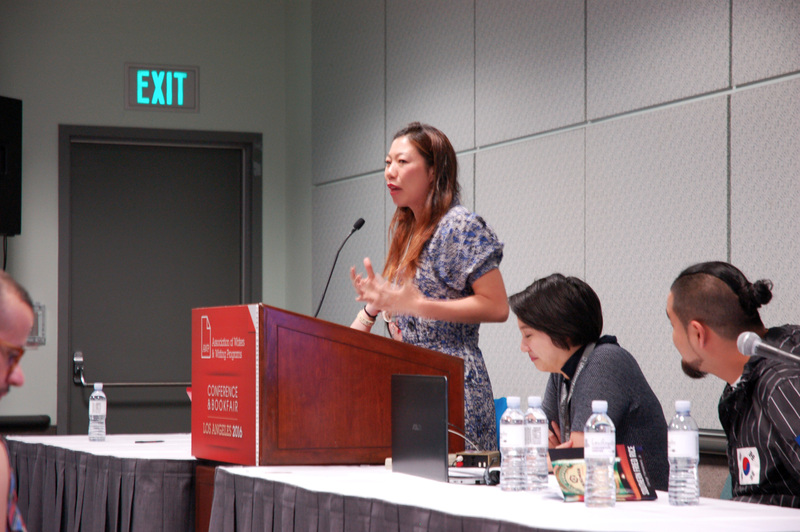 From Action Books’s recent emphasis on publishing translations and original work by Asian American women; to Alice James’s and Tupelo’s past and present partnerships with Kundiman and their promotional efforts that have helped bring Kundiman Prize winners like Cathy Linh Che and Janine Joseph to the attention (and acclaim) of national outlets like Publishers Weekly and the LA Times; to the enormous amount of marketing muscle that Copper Canyon has put behind Ocean Vuong’s blindingly successful collection Night Sky with Exit Wounds—we need more allies who are willing to undertake work like this. We need publishers to collaborate with us, to move beyond numbers and tokenism, and to fully embrace inclusion. 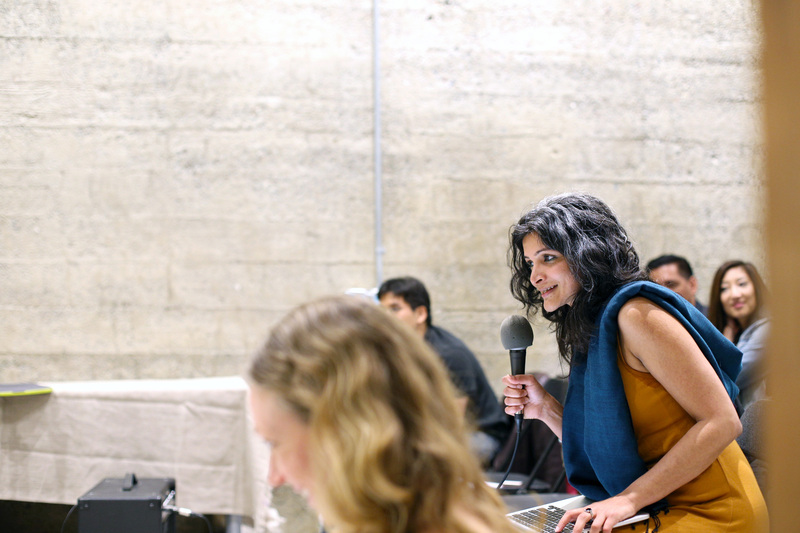 Monica Mody sits among the audience during her performance at the American Bookbinders Museum and invites them to complete the fabric of a poem in a collaborative act of healing and remembrance for voices that have been silenced and stories that are yet untold. Along the same lines, we need to learn to be good allies ourselves. We need to be able to reject hatred directed at other marginalized communities (from the poems rife with Native American stereotypes put out by the Kenyon Review earlier this year to the violently transphobic essay recently published by the Antioch Review); to listen to and validate others’ experiences of pain; to recognize the ways in which we ourselves hold privilege; to know when to be quiet and when to speak; and to collaborate with others toward common goals. This means, among other things, that getting behind the Black Lives Matter movement is important. Speaking out against racism and systemic violence of any sort (especially when perpetrated by other Asian Americans) is important. Intersectionality, in all its forms, is important. Community myopia serves no one but the systems of power that seek to divide and conquer for their own gains. Candy Shue addresses the audience at the American Bookbinders Museum. In the midst of all of this struggle and heartbreak, it can be tempting to adopt a defeatist attitude. But it’s worth noting that now is also an incredibly generative time for the Asian American literary community. 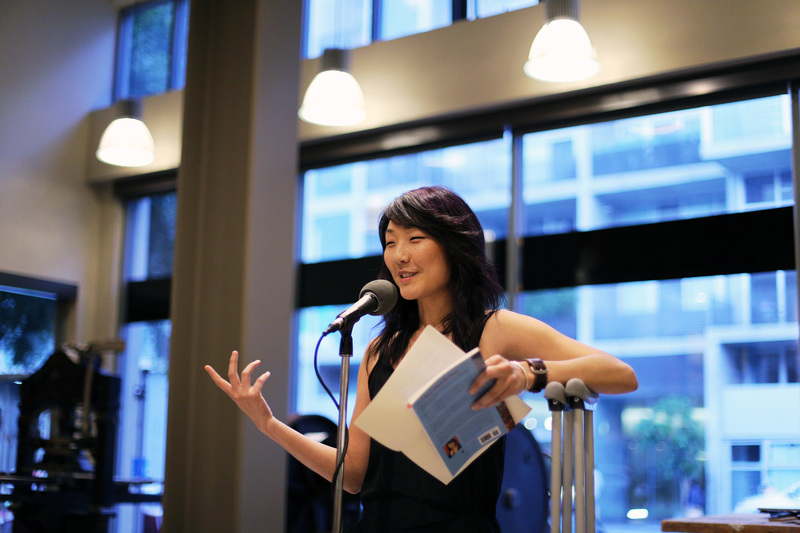 Actual Asian American bodies have been omnipresent in the national literary landscape. Consider the following, all of which have happened in recent memory. Ocean Vuong has blossomed into a superstar and literary darling (interviewed and published in the pages of the New Yorker, featured on public radio, dubbed “NYC’s Latest Prodigy” in a display at the Strand bookstore), such that Night Sky with Exit Wounds sold out of its first print run within just a couple weeks of its release. Rick Barot was recently awarded a Guggenheim Fellowship. Sally Wen Mao was announced as a 2016–2017 Cullman Center Fellow. Viet Nguyen won the Pulitzer. Khaty Xiong, whose Poor Anima was the first full-length poetry collection by a Hmong American woman to be published in the US, was recently awarded an Ohio Arts Council Individual Excellence Award. Christopher Santiago was announced as the winner of the 2016 Lindquist and Vennum Prize. Michelle Peñaloza won an Artist Trust Fellowship. 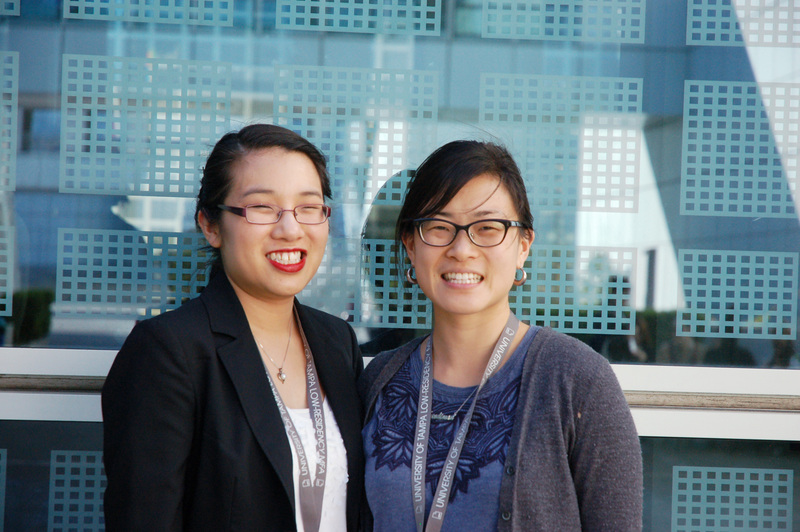 Jane Wong and Jess X Chen have both delivered powerful TedX talks in the space of the past two months. 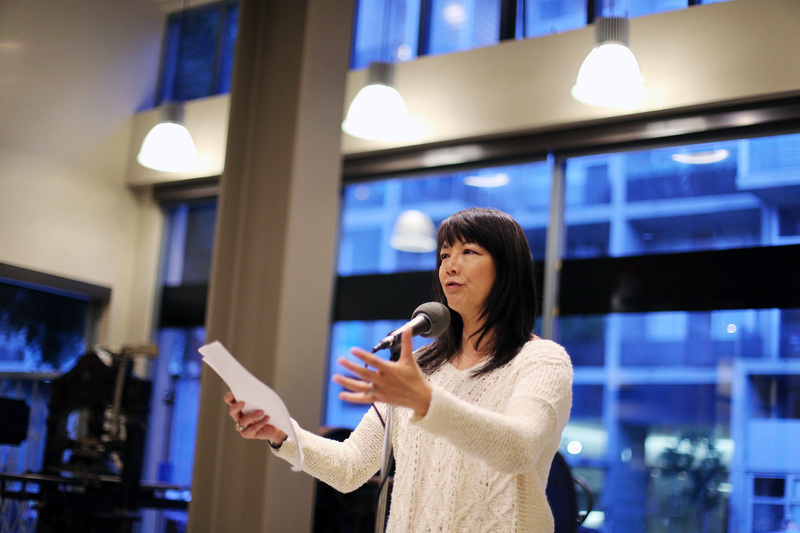 Earlier this year, Mai Der Vang won the Walt Whitman Award, and Kimiko Hahn was named president of the Poetry Society of America during the same week. The list goes on. Debbie Yee reads at the American Bookbinders Museum after meditating on the image of the body as book. 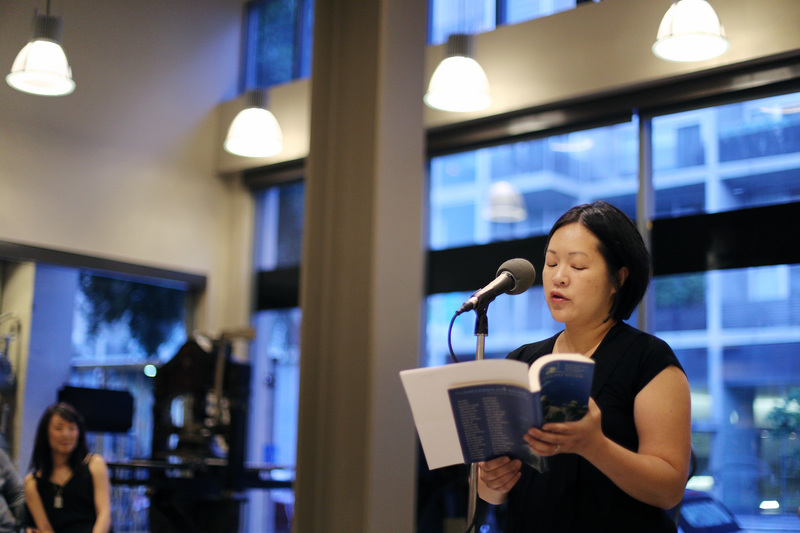 During our reading at the American Bookbinders Museum, Debbie Yee prefaced her segment of the evening by explaining how, especially since becoming a mother for the second time, she’d been spending a lot of time thinking about how the body itself may be a kind of book. Indeed, as poets, editors, teachers, and scholars who are simultaneously Asian Americans and members of the literary community, both our physical bodies and our bodies of work inhabit textual spaces that are filled with possibility. Our bodies and our books have for so long been written over with narratives imposed upon us by others, but our community continues to fight to reclaim what is our own and to reinscribe the spaces that we inhabit with our own stories. There is so much work still to be done, and yet there is also so much to celebrate. It’s a difficult time, but it’s also a wonderful time in which to stride forward together in hope. 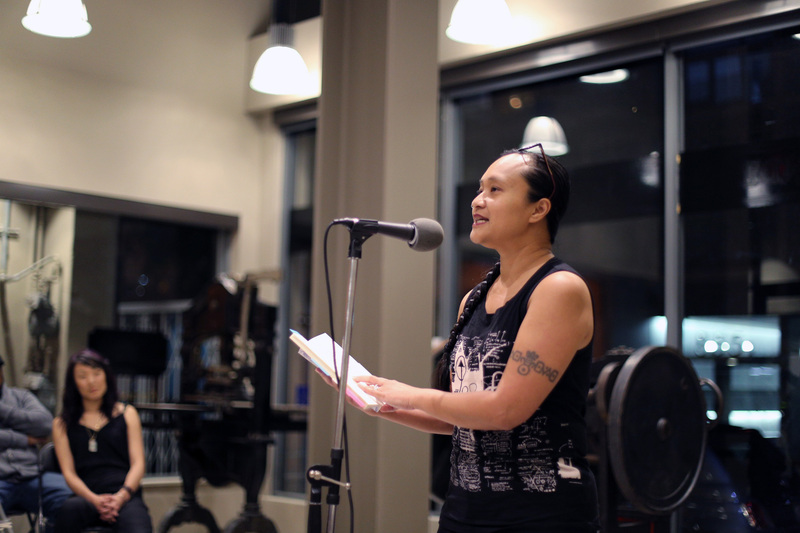 What are your hopes for the future of the APIA literary community? What can we at LR do to better contribute to the goals of increasing APIA literary representation and promoting healing and dialogue? We would love to hear from you! 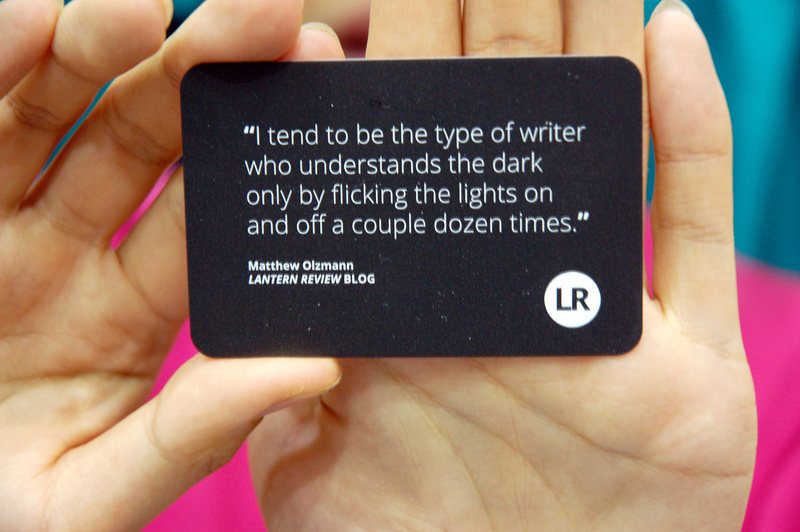 Please leave us a comment, send us an email (editors [at] lanternreview [dot] com), or share your thoughts with us via Facebook, Twitter, or Instagram. Unless otherwise noted, all photographs in this post were taken by the author.